The EasyStripper™ multifunction wire stripping tool makes wire stripping fast and easy. This self-adjusting tool can strip wire from 10 – 26 gauge, stranded or solid core wire with one squeeze of the handles. The replaceable jaws grab the wire jacket, cut it and strip it away in one smooth motion. 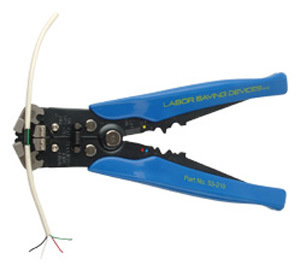 Built of solid high quality construction, the tool also provides connector crimping and wire cutting capabilities built-in to the handle. This one tool can replace several tools in your toolbox.